So far, over 24,215 kilometers (15,046 miles) from Anchorage, Alaska to Tala Bay, Aqaba (Jordan) spent cycling, trekking, skiing, kayaking, rowing and swimming , Nexus Expedition has very much appreciated and learned to rely on fine products. We plan to continue to select and maximize the use of these products over the years to come and we encourage you to go ahead and try as well these products and services! Point 65 Sweden, founded in 1996, is a leading outdoor brand in Northern Europe. Point 65 Sweden offers a wide range of paddle sport products and is the company behind the ingenuous modular take-apart kayaks Falcon, Gemini, Tequila!, Martini, Mercury and the KingFisher. Point 65 Sweden also offers a wide range of state of the art, truly unique and innovative bags and hard shell back packs which double as the highest rated spine protectors in the world and also protect your gear (formerly Boblbee). Representing Quality Outdoor Gear to the Pacific Northwest. Ibex is a designer of year-round merino wool and responsibly sourced outdoor clothing and cycling apparel, founded in the belief of the superior natural performance and properties of wool. Ibex couples the natural renewable resource with technical innovation and inspired design to create apparel for a diverse range of outdoor and active pursuits and passions. Free Range Cycles is a great bicycle shop located in Fremont, Seattle, USA. They have provided to us over the years, a great amount of support. For more than twenty years Tubus has build bicycle carriers from high strength steel tube. They develop and manufacture carriers according to their philosophy to unite highest product quality and longevity in a beautiful product. Plan the Perfect Route Ride with GPS makes it easy to drag and draw your own custom routes with lightning fast elevation profiles to help you anticipate (or avoid) those big climbs. Xtracycle pioneered cargo bikes and longtail bikes in North America 15 years ago. The company creates products that help you carry what you need, giving you more reasons to ride. Nuun has essential electrolytes, no sugars and a light, refreshing taste! Hydration is more than just water. Make your water count! First-class dental laboratory which is proud to cooperate with some of the best dental studios around the world. 1iOpen is a full service production house. We produce all types of entertainment including films, documentaries, TV, commercials, music videos, events, web video and more. Taking "All Profits to Charity" inspiration from Paul Newman, Tamandua Hosting provides reliable, friendly, and all-around excellent web hosting, while giving small businesses and individuals a way to financially support the work of nonprofit organizations they care about. Established in 1988, Davis has been producing quality Custom Signs and Banners in Seattle, USA for 25 years! HumanEdgeTech is a division of Explorersweb Inc. Run by explorers for explorers. The mission of HumanEdgeTech is to develop and provide small, lightweight and user-friendly software and hardware solutions for communication in the most extreme environments. Gregory has defined quality, comfort and fit for over 30 years. We research, design and build products that meet a higher standard for those whose adventurous lifestyles demand it. We hope our products motivate you, as they do us, to get out and live the good life. We work with Helly Hansen, Nemo, O'Neill, Vasque, Sole, Sunski, Bogs and Kleen Kanteen. Suunto was founded in 1936 by Tuomas Vohlonen, a Finnish orienteer and inventor of the liquid-filled field compass. Since then Suunto has been at the forefront of design and innovation for sports watches, dive computers and instruments used by adventure seekers all over the globe. Rite in the Rain is an environmentally responsible, all-weather writing paper that sheds water and enables you to write in any weather. They provide durable, 100% recyclable, all-weather paper to outdoor professionals and enthusiasts who cannot afford weather delays. Evernew Inc. has been developing, manufacturing and distributing the finest in sporting goods for the past 85 years. Their reputation for the highest quality, lightest weight and most compact backpacking gear is unsurpassed. Second Ascent is a one of a kind outdoor retail shop that has been in business since 1996. They specialize in all facets of backcountry activity from climbing, backpacking and hiking to skiing and cycling. Jesse Perrel, Dominique Blachon, Dr Alessandro Vincenti, Michele Temperani, Jude Ultra, our friends and families, and countless people, businesses and organizations who continue to support us along the way. 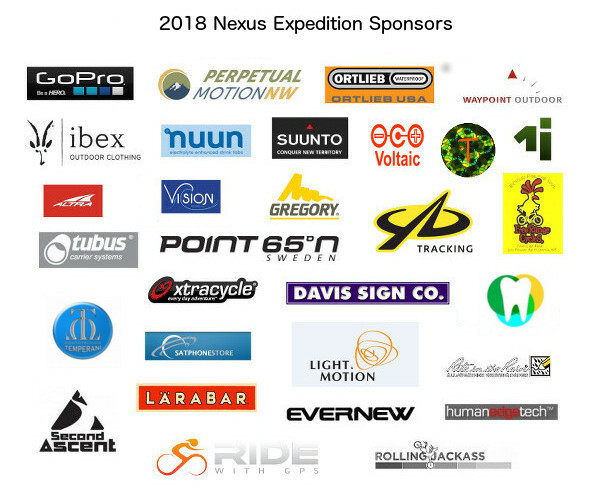 Enormous thanks to Farm To Feet, Westcomb, Black Diamond, Universal Distro, Tamreen, Solio, Nutcase, Chochur Moran, Avia Partner, Batteries +, ACR Electronics, Atlas snowshoes, Baffin, Treksta footwear, Valandré, Teko Socks, ESS Goggles, Trailstove - Woodburning stove, Backpacker's Pantry, Kulu Safaris (Magadan region), Power Film Solar, Pro Ski Service Seattle, Mountain House, Snowsled, Bering Air, Chukotka Discovery, Montrail, Julbo Eyewear, Morovision Night Vision, Seattle Running Company, Frontier Airlines, The North Face, Acapulka Sleds, McMurdo Emergency Location Beacons, Beaver Sports (Fairbanks AK), Apocalypse Design (Fairbanks AK), Eastside Physical Therapy, Radioshack, Lynden International Logistics, Stark, and АЛЬП ЕДА.